Through the prevalence of movies and videogames depicting war, new soldiers in today's armies are more aware of the visceral experience of battle than ever before. A green army recruit in the middle ages probably had almost no idea what war actually feels like. What he had was pieced together from oral history and legends of battle, and didn't help him much when faced with the bloody mess of entrails that used to belong to his friend. Even a generation or two ago, back in WWII, soldiers were drafted into the army and only received a very basic training in boot camp for the mental and physical conditioning they would need in the field. Today, as Shawn Williams discusses in Issue 226 of The Escapist, the modern recruit is equipped with a much more sophisticated view of the battle. "The insurgents were firing from the other side of the bridge," Sgt. Sinque Swales told the Washington Post in February 2006. "We called in a helicopter for an airstrike. ... I couldn't believe I was seeing this. It was like Halo." Swales, a combat engineer who served in Iraq with the 276th Engineer Battalion, represents the modern soldier: technically proficient, well-equipped and trained in military tactics long before ever entering boot camp. "Soldiers that come in today aren't like the soldiers from when I joined," says Master Sergeant (Retired) Guy Williams. "They've been playing these videogames since they could hold a joystick. Technology doesn't intimidate them in the slightest." Shooting first and taking names later may work in first person shooters, but gung-ho tactics will more likely produce a bodybag than a hero. 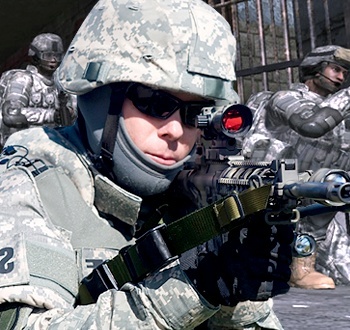 Videogames like America's Army, however, emphasize caution and the safety of non-combatants, and are much more effective tools for training soldiers than anything ever seen before. Take a look at The New Basic Training to hear more firsthand accounts from soldiers and offer your comments.